but it has a serious design flaw: after you mark your ballot, after you review your ballot, the voting machine can print more votes on it!. Fortunately, this design flaw has been patented by a rival company, ES&S, which sued to prevent Dominion from selling this bad design. Unfortunately, that means ES&S can still sell machines (such as their ExpressVote all-in-one) incorporating this design mistake. 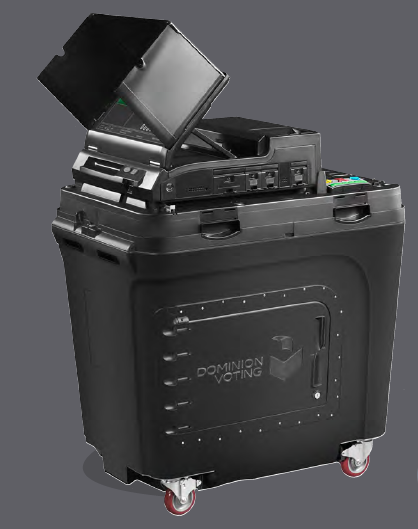 In a typical polling place, there are cardboard privacy screens for those voters who use a pen to fill in the the bubbles on their op-scan ballots; one BMD for voters who want machine assistance marking their ballots; and one optical scanner into which all voters deposit their ballots. In contrast, the ImageCast Evolution is an “all-in-one” device: combination BMD and optical scanner. Most voters fill out their ballots by hand, and insert into the scanning slot. But those using the BMD feature will insert a blank ballot into the scanning slot; after they indicate their choices using the touchscreen or audio/button interface, the ImageCast Evolution will fill in the bubbles on their ballot for them. Combining the BMD+scanner is a really bad idea! Remember, the purpose of the paper ballot is to guard against cheating by hacked voting computers. If the optical-scanners have been hacked, they lie about what’s on the paper ballots. We can detect this fraud by recounting a random sample of the paper ballots. But the ImageCast Evolution can print right onto your ballot, after you insert it into the slot. From the diagram of the paper path, above, it’s pretty clear that the same bidirectional paper path contains both the scanner and the printer. That means it can cast more votes onto your ballot. Of course, the legitimate software installed by Dominion won’t do that, but the machine is physically capable of it, and fraudulent software can exploit this ability. When I feed my marked ballot into an optical scanner, I do not want the optical scanner to have the ability to fill in more bubbles on my ballot! The whole purpose of the paper ballots, and the human-inspection random audits, and the human-inspection recounts, is to guard against the possibility that a hacker installed cheating software into the voting machine. If the cheating software can mark my ballot, after the last time I can inspect it, then the ballot seen by the recount team is not the same as I marked it. Hacker exploits a security vulnerability of the ImageCast voting machine or on the election-administration laptop computer that prepares ballot files. For example, the ImageCast has several USB ports, and USB is notoriously insecure. Hacker uses this vulnerability to install additional software on the ImageCast, that fills in additional ovals on the op-scan ballot, after the voter has inserted it for scanning. For extra credit, don’t perfectly fill in the ovals like a BMD normally would; instead, mimic the style that the voter has used with a pen. For double-extra-credit, do this only when the scanner detects that the voter has used a similar color pen to the ink-jet cartridge in the BMD’s printer. For triple-extra-credit, only fill in ovals in races where the voter hasn’t already marked a vote, this avoids overvotes that would draw attention to the paper ballot during an audit or recount. Dual Display Video (click here, scroll down to ImageCast Evolution, click on the second blue square labeled “VIDEO”). Dave (Jing) Tian, Nolen Scaife, Deepak Kumar, Michael Bailey, Adam Bates, Kevin R. Butler. SoK: “Plug & Pray” Today – Understanding USB Insecurity in Versions 1 through C. 39th IEEE Symposium on Security and Privacy (Oakland ’18), May 2018. Note added on March 5, 2019: This machine has a “permission to cheat” mode just like the ES&S ExpressVote. On January 23, 2019, addressing the Westchester County (NY) Budget and Appropriations Committee, Dominion regional sales manager Gio Constantiello explained (at minute 0:41:40) that the voter using the BMD has the option of having the ballot ejected for inspection before reinserting it for scanning, or can choose to have the BMD-marked ballot directly scanned and dropped into the ballot box without any human inspection. It’s shocking that anyone would even consider such a design for a voting machine. Do people who design bank vaults put a screen door on the side? I guess this is what happens when design is driven by profit instead of purpose. So, should we start patenting really bad voting machine designs to prevent manufacturers from implementing them? In Hawaii (and very many other Western states) vote-by-mail is becoming normed, and may soon be the only allowed method of voting. There seems to be near-total opacity around how vote-by-mail is actually conducted, and what systems are in place to conduct the tally. I have seen one newspaper article here where the county election official stated that software/optical reader was used to compare signatures on the ballot envelope with an application signature. That’s the most I’ve seen on it.